There is the most transcendent joy in eating a beautifully cooked steak at home. Simply cooked, with a crusty charred outside and juicy pink inside. The added satisfaction that it’s cost one quarter what you’d pay in a high-end steakhouse. All you need is good beef to begin with and the rest is obvious isn’t it? Well no, at least I don’t think so because if it was then everyone would be eating top quality steak at home regularly and I don’t think they are. Not nearly as regularly as they should be. So here’s a guide to cooking and eating the best steak possible at home. When I talk about steak I mean a fat steak at least 4cm thick. 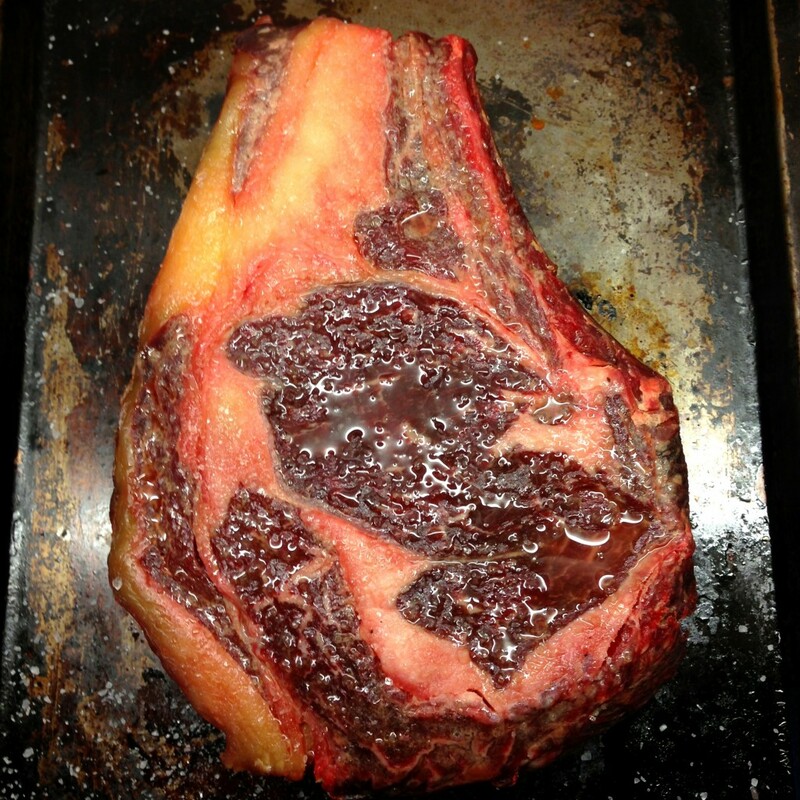 A forerib on the bone (the French would call a Cote de Boeuf), a wing rib, sirloin on the bone or a T-bone steak. The T-bone (or Porterhouse) steak is the one made famous by New York steakhouses such as Peter Luger where a steak for 2 can cost up to $100. It’s supposedly the best steak in NY and by extension the world, or at least that’s what NYers would like you to think. Peter Luger has first choice of the USDA Prime beef that comes into the city so eating there is truly a pinnacle of steak eating experiences. 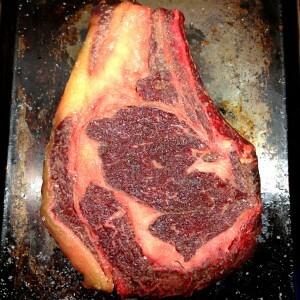 The steak there is wonderful; soft, juicy and buttery unlike anything us Brits can produce. But there is a deep dogma in the USDA grading system that means beef is graded purely by the amount of fat marbling apparent in the meat (like in Japan). This has led to decades of breeding animals that react better to the hormones fed to fatten them and to the copious amounts of grain used to finish the cattle in the weeks prior to slaughter. This consistently gives fatty marbled meat that is so visually appealing and tender but has ultimately led to the most important aspect being overlooked, beefy flavour. In the UK we’re unbeholden to grading systems and rely on our senses to judge whether a cut of beef is top quality. I have my favourite cuts of meats; forerib and T-bone. What I look for is properly dry-aged meat at least 4 weeks. 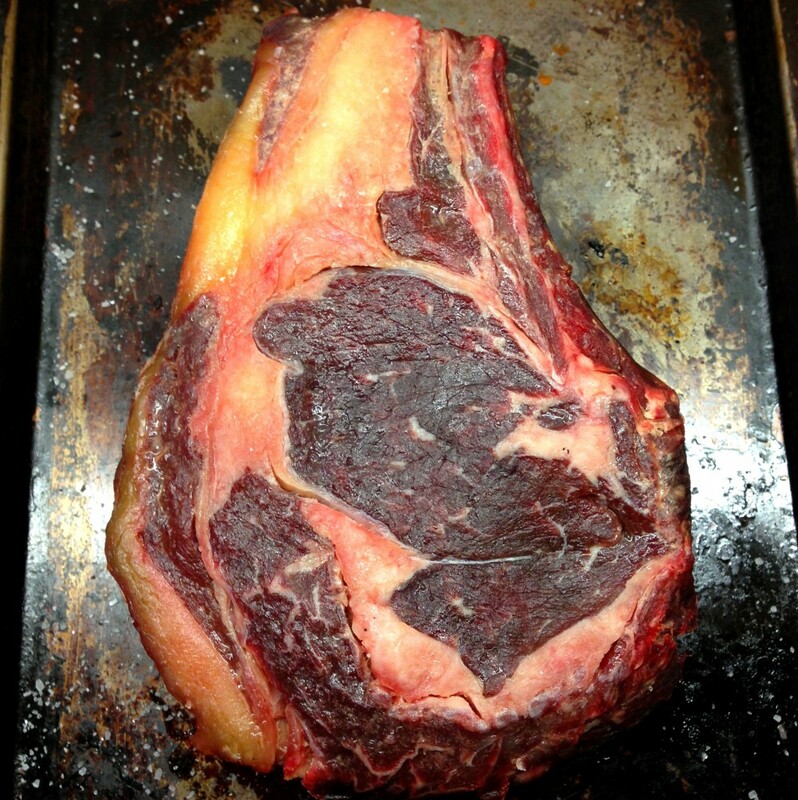 The dry-ageing not only improves the flavour of the meat but tenderises too. To my mind it makes all the difference. Good marbling is nice but not as important as breeding and feeding. What do I mean by that? 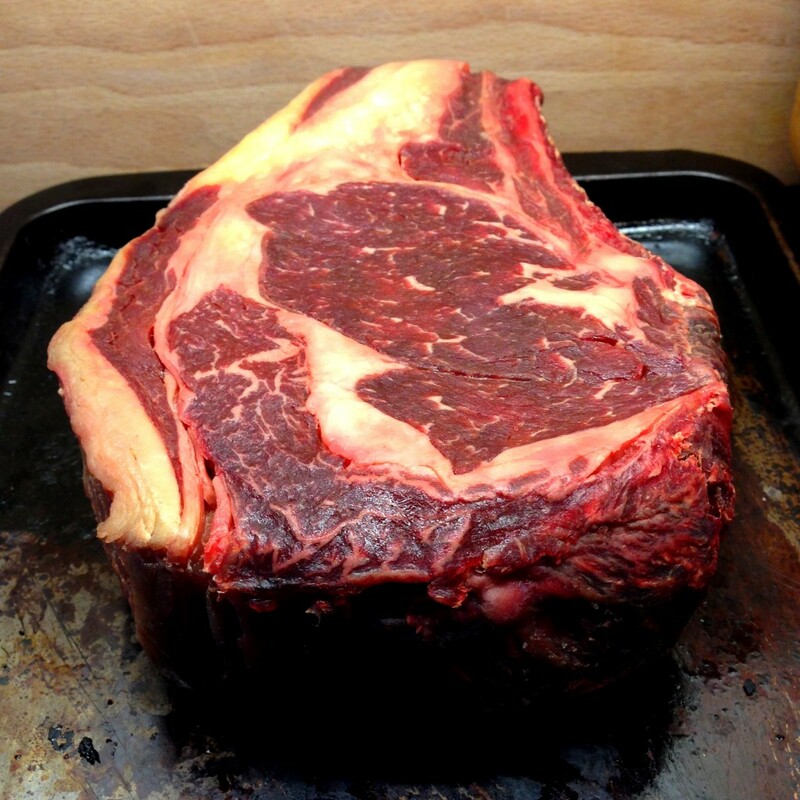 Well take a look at the 6 week dry-aged grass-fed forerib of Dexter beef in these photos. It just screams BEEFY! You will never find this in a supermarket or ordinary high street butcher, that is why specialists like Berkswell Traditional Farmstead Meats and Aubrey Allen are so important. 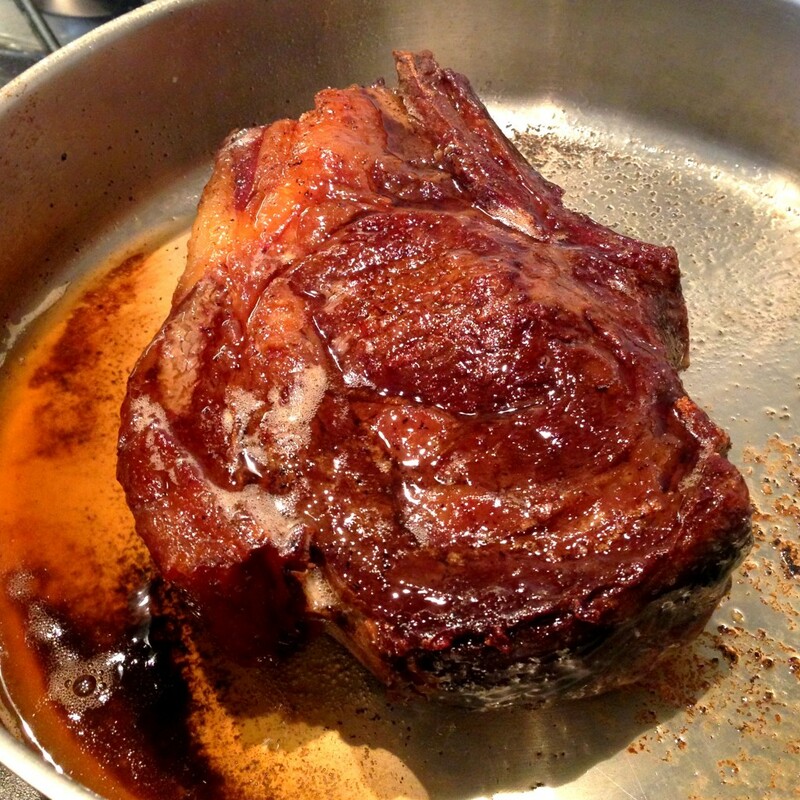 – Cook your steak on low to medium heat in clarified butter on one side for ten minutes. – Flip and cook it on the other side for another ten minutes. All while basting with the clarified butter. – Let it rest for another 10 minutes before carving into thick slices. Dress the meat with the beefy butter left in the pan. That’s it! The first shows the steak freshly sprinkled with salt, when this hits the pan a nice salty crust will form but the meat inside is not really seasoned. The steak after ten minutes, the salt has drawn out the water from the meat and it’s pooled onto the surface. When this meets the pan the meat will tend to stew preventing the formation of the nice flavoursome crust. The meat is not seasoned and it’s lost a lot of moisture, bad news all round. After a few hours the salty water has been drawn back into the meat seasoning it from within. The surface is dry so there’s nothing to stop a great crust from forming. So it’s clear, it’s best to season on both sides a few hours beforehand. Or if you’re in a rush season on one side just before frying that side and season again just before flipping. Never ever do anything in between. Simmer the above for 15 minutes then add a teaspoon of finely grated ginger and simmer for another 5 minutes. Take off the heat and stir in one tablespoon of yuzu juice (or a mixture of lime and Seville orange). The sauce will keep for a while in the fridge. This is such an awesome post. I’m giving that method a try. A man after my own heart!! Why pay Steakhouse (or even some high end restaurant) prices when you can do better at home for a fraction of the price. I’m a miserable Scot and my rationale is that spending £30+ on a wee sirloin or rib-eye steak that in turn deserves a bottle of wine of at least the same (restaurant) price, means that if I do it at home I can select a (bigger and better) prime forerib of my choice and I get an even better bottle of wine free with the savings and still be quids in. Indeed! Though you needn’t be Scots or particularly miserable to see the sense in all this. The markup on steak is ridiculous considering the level of skill needed to cook it. A ‘skill’ that is sadly missing in a lot of restaurants. I think cooking steaks is considered to be so easy that it’s delegated to the lowest paid trainee or commis to do while the ‘chef’ deals with the foams and the baby-leaf garnishes that make the plates look pretty. This is also the method that Raymond Blanc espouses. Interesting take on the seasoning. I tend to unwrap the meat for a day or so in the fridge to dry it out a bit which I guess is the same as the salting a few hours before. I’ve heard that seasoning after cooking is also a possibility so that the moisture isn’t drawn to the surface prior to cooking? Either way – the steak looks fantastic. 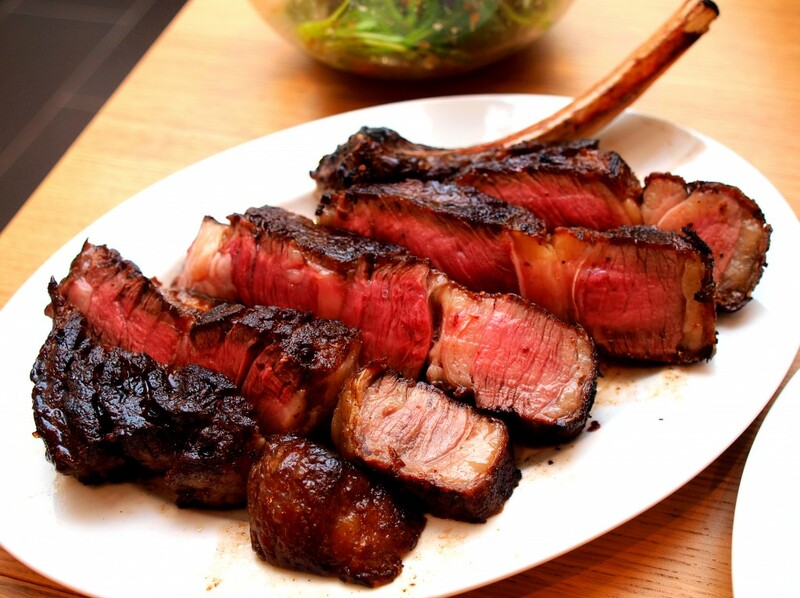 Reminds me of a bistecca alla fiorentina I had at BBQ in Florence. Check it out if you’re ever there. I spose the whole, “salt well in advance thing” does something not dissimilar to the meat brining technique advocated for by McGee, Keller et al. I really want to try cooking a steak this way, but it’s quite a leap of faith to depart from the method you know as tried and true (cast iron grill heated til smoking, cook until just over 50 degrees C inside, leave to rest for 10 mins), especially when you have some decent beef. I never get hold of steak more than about an inch thick, reckon that’s too thin for this method? An inch thick steak is too thin for this method. I’d use the conventional hot sear for it, nothing wrong with that! Ideally 4-5cm (2 inches) is best for this method to make sure it doesn’t overcook in the middle. I once cooked a massive 8cm thick T-bone using this method – it was for 4 people. The centre was still a little cool after the 20 minutes so I stuck it in a hot oven for 10 before resting for 15 mins. Turned out beautifully. 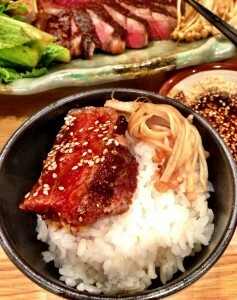 Pingback: The Smoke & Umami connection | The Foodist. Pingback: 2014 in Food | The Foodist. Pingback: The Smoke & Umami Recipes | The Foodist.